Hello! Happy 2013 and Happy 1st Mojo Monday of the new year! It's time for Mojo Monday #275 and it's contest week. Play along for a chance to win Verve stamps! Today's fabulous sketch is by Julee. While I enjoy making cards, I am determined to making Project Life and scrapbooking a priority this year. I love making cards and altered gifts, but there never seems to be enough hours in the day to everything that I'd like to do, including spending family time off the computer. So, this year, I am committing myself to "document" our life more by making memories and preserving them. This 4 x 6 card will be part of my 2013 Title Page, which I will share in its entirety when I complete it (I am waiting on some supplies to arrive in the next week or so). I used the Gandhi quote (from Text Objects) which reads "Where there is love there is life". I also used some digital patterned papers from the PL Seafoam collection (the core kits are not available on Amazon yet, so I used the digital collection to get started). The "k" is a foam letter sticker. Accessories: 1 3/8" circle punch (EK Success), Rhinestone circle (CTMH), Foam letter sticker (American Crafts), Seam binding, Foam tape, Thread, Sewing machine. Fantastic idea on using the sketch for a PL card! I'm starting my PL journey this year and am super excited! Love how you flipped the sketch! Also loving all that white space :) Great take on the sketch. 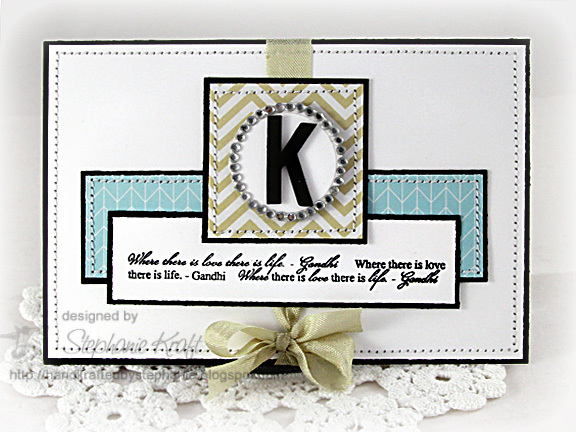 What a gorgeous card for your first page!!! I just finished up my title page today!! So excited to start this year and hopefully keep it simple and stay on top of it - LOL!!! Hope you are well and you had a wonderful holiday season!! Gorgeous card! I have several friends doing the Project Life..it seems so fun!! Hope you'll share as you go! How creative to use this sketch for your project title page! Love the clean design! Now that my kids are grown, scrapbooking has taken a back seat. Enjoy your time at CHA...looking forward to getting feedback from all you lucky people in attendance! This is so fabulous, Steph! I'm planning on doing Project Life this year, too and it's such a great idea to use card sketches for some of those 4x6 pockets.